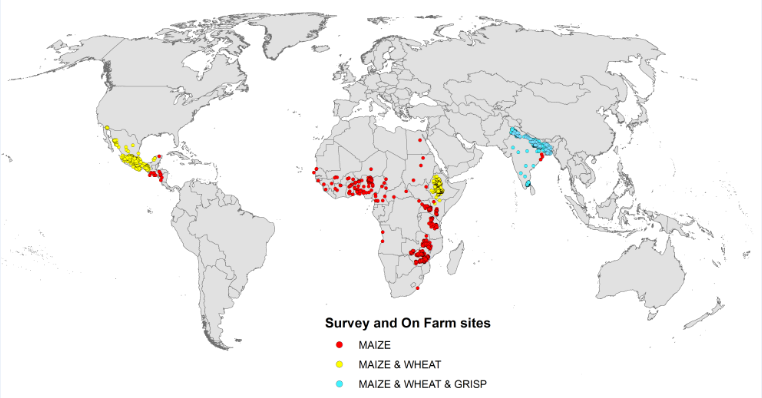 MAIZE’s activities under the different Flagship Projects are implemented in Asia and Central and West Asia, Latin America and the Caribbean, East and Southern Africa, and West and Central Africa. Maize is widely cultivated throughout the world, and a greater weight of maize is produced each year than any other grain. The United States produces 40% of the world's harvest; other top producing countries include China, Brazil, Mexico, Indonesia, India, France and Argentina. Worldwide production was 817 million tonnes in 2009—more than rice (678 million tonnes) or wheat (682 million tonnes). In 2009, over 159 million hectares (390 million acres) of maize were planted worldwide, with a yield of over 5 tonnes/hectare (80 bu/acre). Production can be significantly higher in certain regions of the world. Food and Agriculture Organization of the United Nations, Statistics Division (2009). "Maize, rice and wheat : area harvested, production quantity, yield".